Charley Jones. the historian of the Choctaw nation, tells us that Pushmataha, a Choctaw chief from the early 1800's,, once predicted that the Choctaw war cry would be heard in a foreign land. WWI fulfilled Chief Pushmataha's prediction. Joseph Oklahombi, born May 1, 1895, enlisted in the U.S. Army May 25th, 1918. 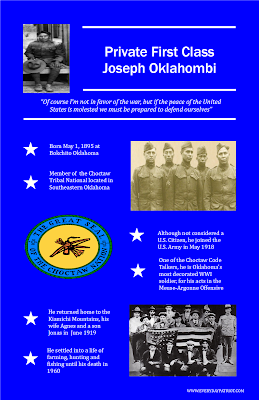 It is remarkable that PFC Oklahombi (as well as other Choctaw tribal members) enlisted at all. The United States government did not, at this time, recognize Native Americans as Citizens. 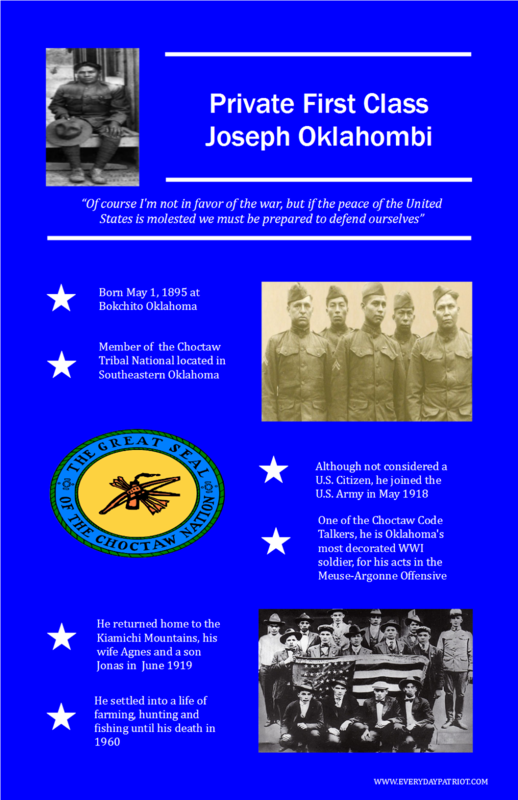 PFC Oklahombi, with 19 other Choctaw tribal members were the first "code talkers" for the U.S. Military. By using a language, which would have gotten them abused for speaking it within the U.S, used the Choctaw language to confuse and stump the German army. The success of the Choctaw Code Talkers paved the way for the future use of Native American languages (the Navajo and Comanche) to confuse enemies. PFC Oklahombi is also considered to be Oklahoma's most decorated WWI soldier. Earning a Silver Star and the Croix de Guerre, for his actions during the Meuse-Argonne offensive, where he almost single handled captured 171 enemy soldiers. After his discharge in June of 1919, he returned to the Kiamichi Mountains of Oklahoma, and his wife Agnes and new son Jonas. He lived quietly farming, hunting and fishing until his death from an auto-pedestrian accident in 1960. He was finally granted citizenship with the passage of the Indian Citizenship act of 1924. 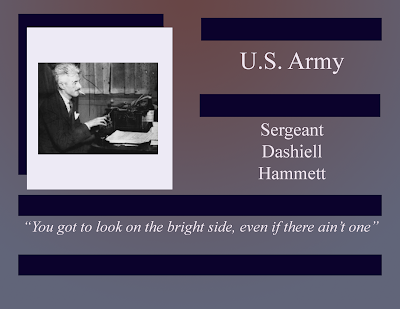 Dashiell Hammett was born on May 27, 1894, he was raised in Baltimore and Philadelphia. He left school at the age of 13, working at odd jobs before joining the Pinkerton National Detective Agency. Sergeant Hammett worked as a Pinkerton detective from 1915 to 1922, taking 1918 to enlist in the U.S. Army Ambulance Corp. During his enlistment, Sergeant Hammett contracted the Spanish Flu and then Tuberculosis, which would plague him for the rest of his life. Unable to maintain his career as a detective, Sergeant Hammett began publishing detective novels, including The Maltese Falcon. In addition to his writing, he was also a left-wing activist, and, during 1930, joined the Communist party. Born on May 22,1925 in Danville, Virginia, Sergeant Herman Scearce, growing up in an area hard hit by the depression, lied about his age and enlisted in the U.S. Airforce. 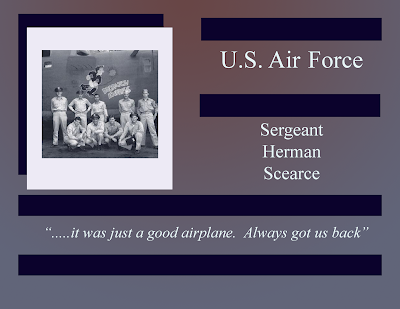 Sergeant Scearce was trained as a radio operator and gunner, and he was assigned to fly with the "Grey Geese" B-24 Liberators in the Pacific Theater. Flying on the plane "Dog Patch Express" - his team participated in the first bombing runs on the Island of Nauru. A thorough history of the B-24's can be found in "Finish Forty and Home: The Untold WWII Story of B-24's in the Pacific" written by Sergeant Scearce's son. Philip Scearce. Sergeant Scearce remained in the U.S. Airforce until his retirement in December of 1962. He embarked on a second career as County Magistrate until 2005. He died on March 26, 2015. 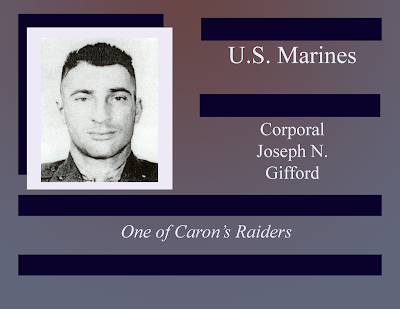 The Californian, Corporal Joseph N. Gifford was one of the Marine Raiders. Created during WWII, they are considered to be one of the first "Special Operations" military units developed. Assigned to the 2nd Raider Battalion, also known as "Carson's Raiders", Corporal Gifford took part in the raid of Makin Island and was captured by the Japanese. He was executed October 16, 1942, and is memorialized in the Courts of the Missing, at the Honolulu Memorial.